It's been hell week(s) for me where I haven't had a lot of time to post what I've been working on lately. 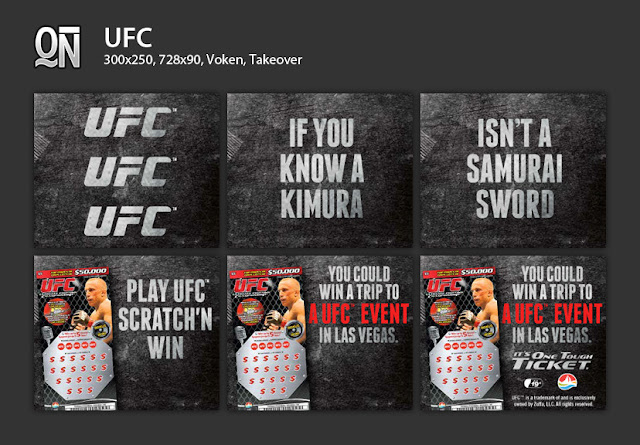 My latest project was for Revolve an Ad Agency in Nova Scotia where I had the opportunity to work on a set of UFC banner ads. The build required 10x standard banner ads, 1x Voken banner ad and 1x Takeover banner ad. You'll need to click the links to view the Voken and Takeover banner ads. They are way to big to embed here. It is a blur right now but I'm hoping to get some more time to trace back my steps and post the other projects I've worked on prior to the new year. In all honesty, I thought this project fell through as I remember having conference calls in late November about it and I never heard a peep until mid January when it dropped in my inbox. There was a little P.S. beside it that said that it was due to Eyereturn, a 3rd party Ad serving company in Toronto, the same day I received it. Everyone was out and I wasn't able to get access to the files until the next day. Not that it mattered since I was finalizing the last of 4 projects that carried over from December into the New Year. In the ad world everything is due yesterday and to me this was nothing new. Just another monster of a project that I have to go toe-to-toe with in the octagon. I put aside sleep and filled my veins full of coffee and over the course of 2 days straight I finished the project. Funny thing was when I was about to catch some zzz's I had this nagging feeling that it was too easy. Something had to screw up it was way too smooth of a development process. It finally clicked in and I remembered you couldn't use blend modes in banner ads over HTML. I had to go and photoshop all the elements that were using blend modes so it would work naturally without blend modes. To give you an idea of how difficult that was just imagine trying to knock out all the black in a black and white photo leaving behind only the white portion without any colour bleeding. The other issue was the Takeover ad which required manipulating the HTML elements. In some cases this can be done where you can manipulate HTML DIVs by utilizing some JS but you need complete access to the website to implement something like that. The result was an overhaul of the creative as it wasn't possible to do manipulate the live site. To do so would cost an extra $3500+ to utilize a technology that would allow you to. Seems kind of pricy I'm almost tempted to write one myself and charge less for its use.